Strips of scrap fabric, sewn on to a backing. In this case a stiffish calico, because it's going to be a bag. and then maybe I'll do some handstitching too, a fun project to do because you can make it up as you go along. I like to make things up as I go along, when I went to a school reunion a little while ago, I told my old teacher that I was a pole dancer. What fun. She didn't look at all surprised though, which is a little worrying. ? Speaking of fun projects, did you here that this is available soon ? If you buy a copy, I'll come over and clean your house for a week. And that'll happen just before you see a pig fly past your window and Hell freezes over . No, but really you must. It looks rather super. I have preordered and paid. I love the scrap strips! and I did all that before I even looked at the projects. Wowie! They look fantastic. 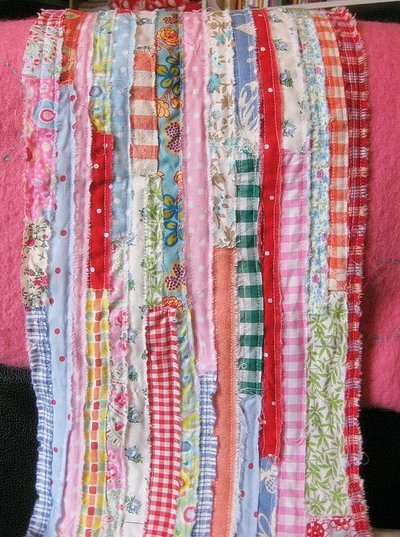 I love that scrap patchwork, it looks really cool, can I have a go? the book looks great too, roll on payday so i can order one. will you really come and clean for me? - you could sort my fabric????? 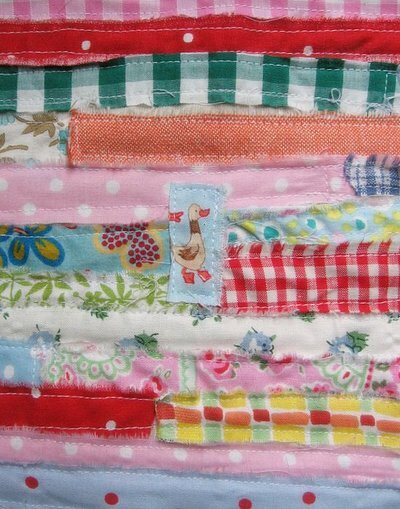 LOVE LOVE LOVE the scrappy patchwork! I'm going to theive that idea right now (as soon as I can find my sewing machine under the mess). Thanks. Also thanks for the heads up about the book - mine is all pre-ordered and I can't wait! i hope you included the fact that you are a rather crafty pole dancer! 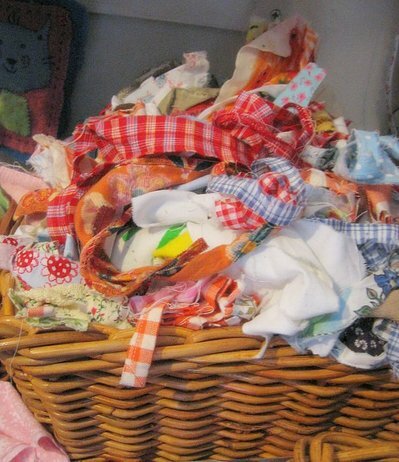 I love the way all the scraps come together to make a wonderful piece of fabric - can't wait to see the finished bag. Hey, I just mentioned the book on your flicker photo (you left that out here for some reason,eh?) --- I better go pre-order before they are all gone! So hey, that thing you do with scraps of fabric! Well, that's just super extraordinary! Heh, the pole dancer thing really made me laugh outloud. You have inspired me to stop throwing all those tiny fabric scraps away! I love those strips. They look so comfy or something. I will pre-order as soon as I can make my darling hand over some his hard earnt Paypal money!!! Yes, yes, and three times a YES. I am buying that book for me and for a friend and more than likely a dozen others. I just ordered two! I so wish all those contributors (including you Ms. Lyn) lived close and I could craft with you. This is as close as I'm going to get. AMAZING lyn, this is absolutely amazing!!! I want to eat it:) That's how amazing it is! 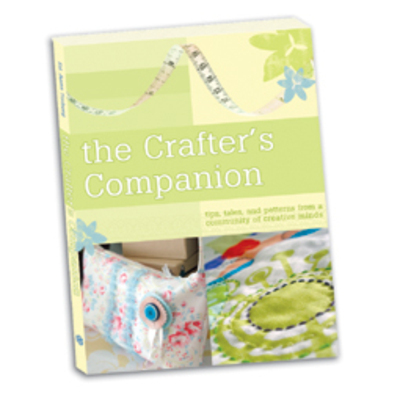 Thanks for the WIP amd "Crafter's Companion" links. I like what you've got planned for your WIP this week--colors are especially pleasing. I love this use of fabric...you'll have to show the bag when its finished! That looks super already! I'm eager to see the completed bag! Yay and Yay and Yay!!! A pole dancer who can also have her way with a patchwork strip...talented! I've pre-ordered and paid for the book and look forward to you showing up to clean my house (oh, I so wish!). Unfortunately there aren't any pigs flying past my window and, since it's 96 here in Tucson, I seriously doubt hell will freeze over anytime soon--ah well. Lover your use of fabric and colour! Oh no....I'm already terrible at not throwing anything away.....hmmm but now I can see what I can do with all those pretty scraps that I have kept. Wowwow. I love this. Now I just have to stare. would you come all the way to france to clean my house??? bravo for the book, I love your work! I'm loving this latest project. I'm obbessed with strips right now, so your bag in progress makes my heart skip a beat. Lovely. And the book...can't wait. i notice youve included the same fabric as you used for your logo's chickie head hanky. i love bits of sweet patterened fabric, it makes me swoon. this is the type of project that i would hold in my lap stroking and cooing, forcing all visitors, including the postmistress, to do it same. How AWESOME!!!! Oh, I have missed seeing your creative projects! Ha! Poledancer, I love it. And I love the bag in progress. I'm on the verge of taking on another craft (besides knitting) and this is exactly the kind of project that makes me feel like sewing is it. Ok! Now I have to delve into the waste basket, pull out all the little tiny strips and scraps that I thought I couildn't use! LOVE you blog, tidy craft room and all the pictures for the Japanese craft magazines. On Saturday I was in a Japanese book store (we currently have a Japanese exchange student living with us) and came upon Cotton & Paint magazine. It is just so beautiful! ok, that scrap strip idea is the best EVER! your project looks fantastic - i can't wait to try this myself! another great idea from molly chicken. and the hits keep comin'! Pole dancing must be so good for craft inspiration - love the scrappy bag project. that pile looks familiar, lyn!! what you did with it came out beautifully. can't wait to see the finished bag! it's amazing! I love that idea! I like to hand sew, too, but more because I have no technique when it comes to sewing on a machine. /me takes note of scrap strips idea for future reference. 1) Re: the pole-dancing fib: I think I'm in love with you. 2) Re: the book: pre-ordered. If you won't come and clean, would you at least come for a cup of tea? Or wine? Or a dirty martini? Well, you cut up all those random strips of fabric right? So that's kind of "striping" and that's like pole dancing so you weren't lying per se . . .